Are you ready for part II of our recent visit to Abu Dhabi? In writing about our trip to Abu Dhabi Part I, I covered entertainment, pools and beaches and shopping. 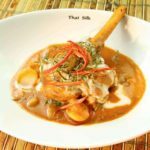 In this post, I shall look at eating out with your little ones and sightseeing in public buildings. Origins at the Viceroy Hotel on Yas Island which was given runner up status for best Friday brunch by Time Out Abu Dhabi in 2013. The Origins brunch is buffet style with a massive assortment of delicious food, including fresh breads, fresh seafood, grilled meats and fish, Italian food, Indian food, Thai food, sushi bar, middle-eastern specialties, salads, and desserts. The atmosphere is buzzy with a live DJ playing European dance music. It seemed very popular with families because children eat free. 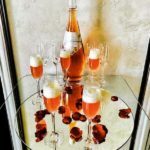 Unless you plan on drinking a lot, paying extra for the all-drinks inclusive is not worth the money. 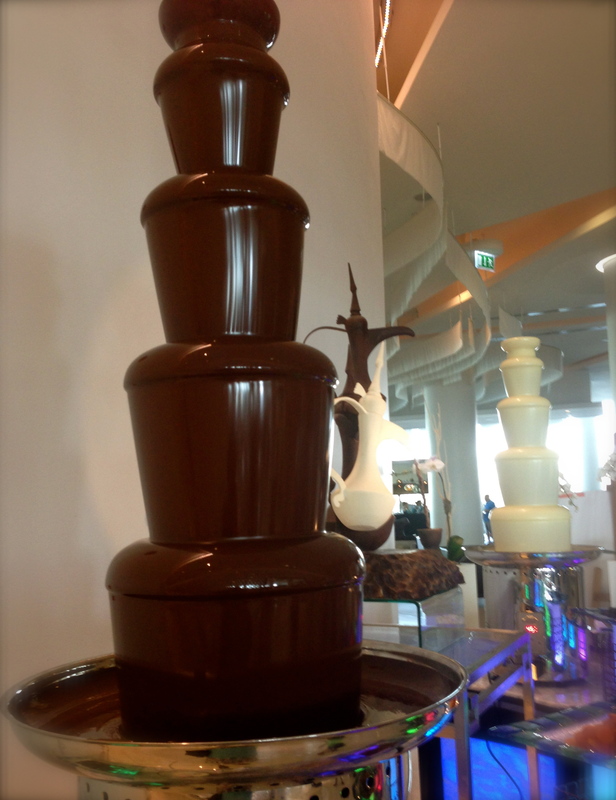 My children were thrilled with the chocolate fountains (one with milk chocolate and the other with white chocolate). 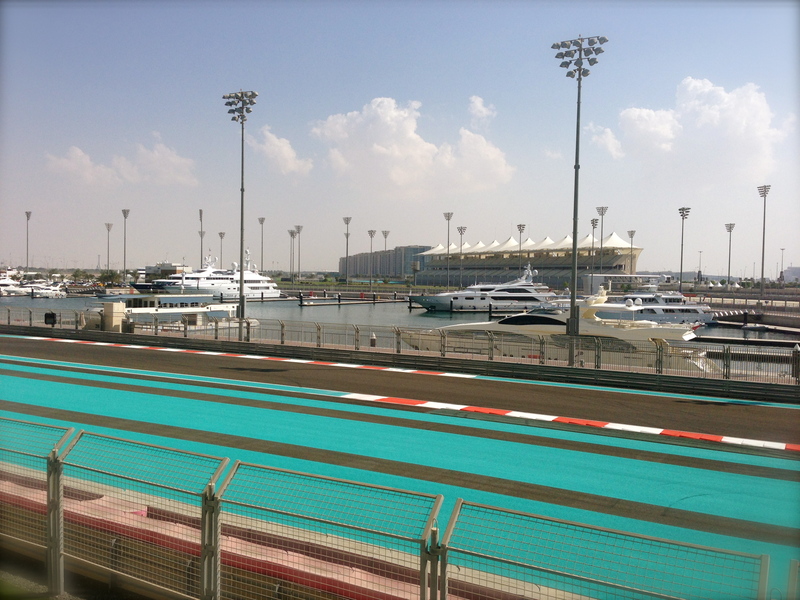 Outside on the terrace you can see where the F1 track snakes around the Viceroy hotel and the massive yachts in the Yas Marina. We also went one night to Bocca at the Hilton Abu Dhabi which was voted Best Italian Restaurant by Time Out this year. The food and wine at Bocca were indeed excellent. My children liked the fresh breadsticks and child-sized pizza on offer. In the Central Market souk, Shakespeare & Co is a good casual option. The decor is charmingly eccentric Anglo-French with random lampshades and mismatched chairs and sofa seating. Shakespeare & Co really looks like someone exploded a shack full of French boudoir furniture. My children loved the tableside cooking by the chef at Benihana at the Beach Rotana Hotel in Abu Dhabi. Don’t judge. 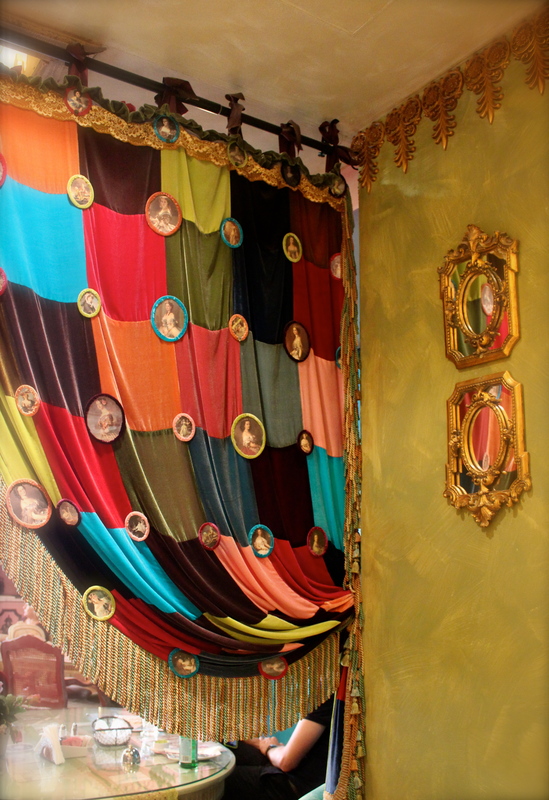 I also really liked Ushna at the Souk Qaryat Al Beri for Indian food. 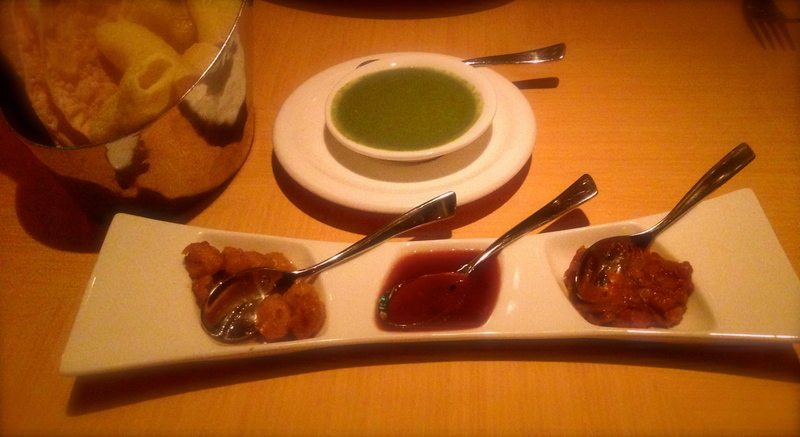 It had been voted the best Indian restaurant by Time Out in 2012. This year, Ushna was the runner-up to the winner which was Angar at the Yas Viceroy. I thought the food was excellent and full of flavour (not just spicy). The service likewise was excellent as is the view from the large windows directly onto the Sheikh Zayed Grand Mosque. The restaurant has an excellent selection of vodkas, including esoteric flavoured ones. 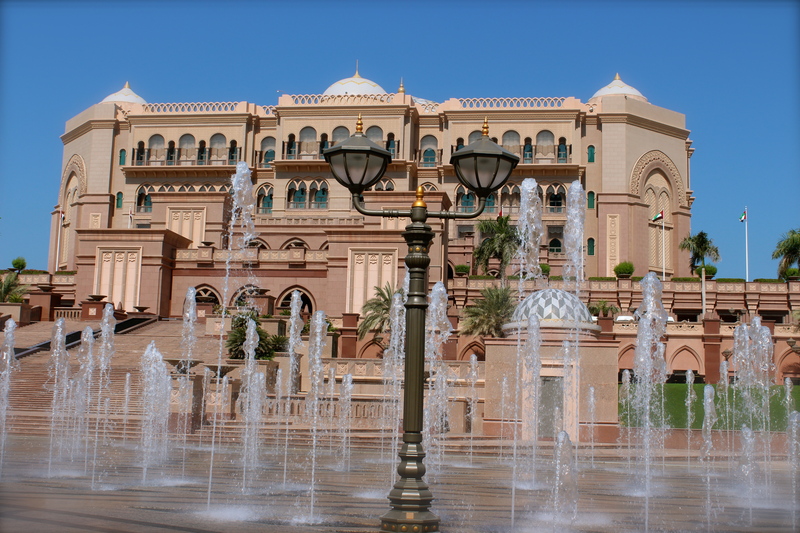 In the case of the Emirates Palace, all that glitters IS gold. While the Burj al Arab in Dubai bills itself as a 7 star hotel, the Emirates Palace doesn’t even bother with star ratings and just goes by “palace”. Star ratings are for commoners, daaahlings. The lobby is gold plated, and Swarovski crystal chandeliers are hung everywhere. There are 114 domes in the building, and the main one, the Grand Atrium dome, is decorated with silver and gold glass mosaic tiles. Of the 8000 palm trees inside the hotel, some are petrified to maintain their natural beauty. The week I was visiting, the King of Morocco was staying at the Emirates Palace. He had booked an extra 200 rooms at the St. Regis for his overflow staff. I’ve got to say, the St. Regis was nothing to sneeze at either. The St Regis was likewise opulent and had a fabulous Gone With The Wind style staircase. It was all I could do not to sweep down the staircase in my best melodramatic entrance. If all that decorative gilt makes you break out in hives, Abu Dhabi does have great contemporary hotels as well. 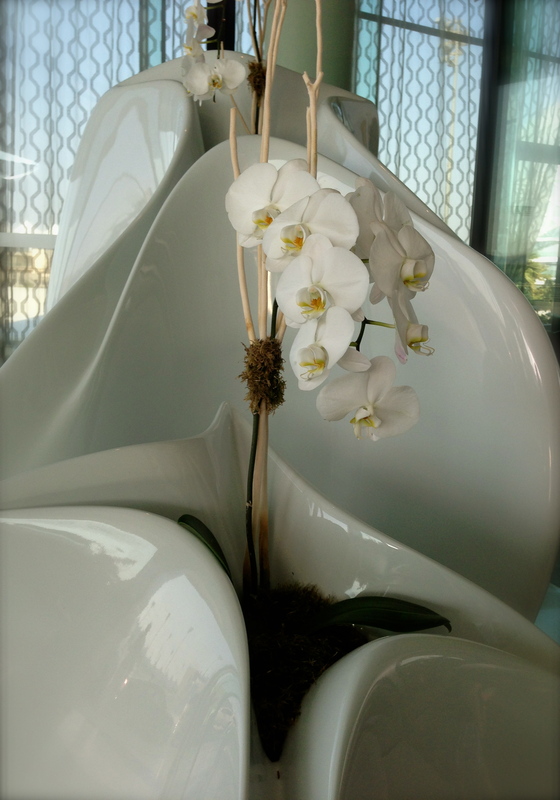 For example, the design at the Yas Viceroy was all-white, sculptural and contemporary. Abu Dhabi is a bit like New York in that it is fond of cool skyscrapers. Many of the skyscrapers are office buildings that the public can’t enter. They are, however, still fun to look at, especially in contrast with the more traditional architecture interspersed among the modern. My children nicknamed a few of the skyscrapers, e.g., the Coin Building, the Booby Building, the Swirly Building etc. Next door to the Viceroy Hotel on Yas Island is a large circular building, O1ne, which is a bar and club. O1ne commissioned 18 street artists to cover every inch of the outside of the building with grafitti. 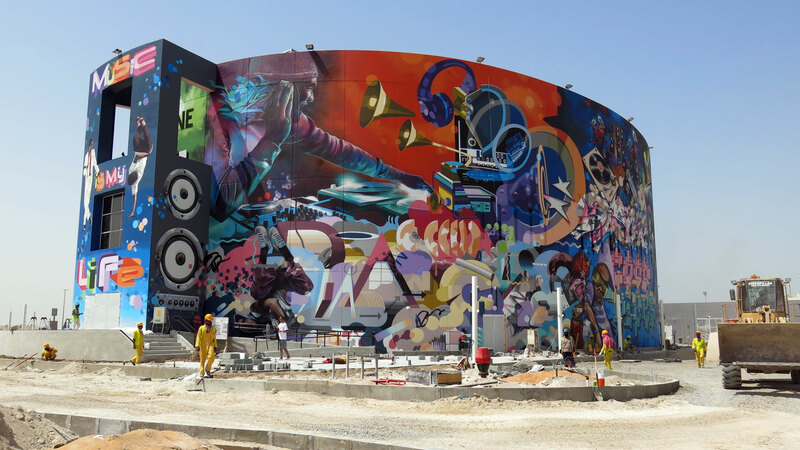 It’s visually stunning but, you will note, even the street art in Abu Dhabi must be legally sanctioned! 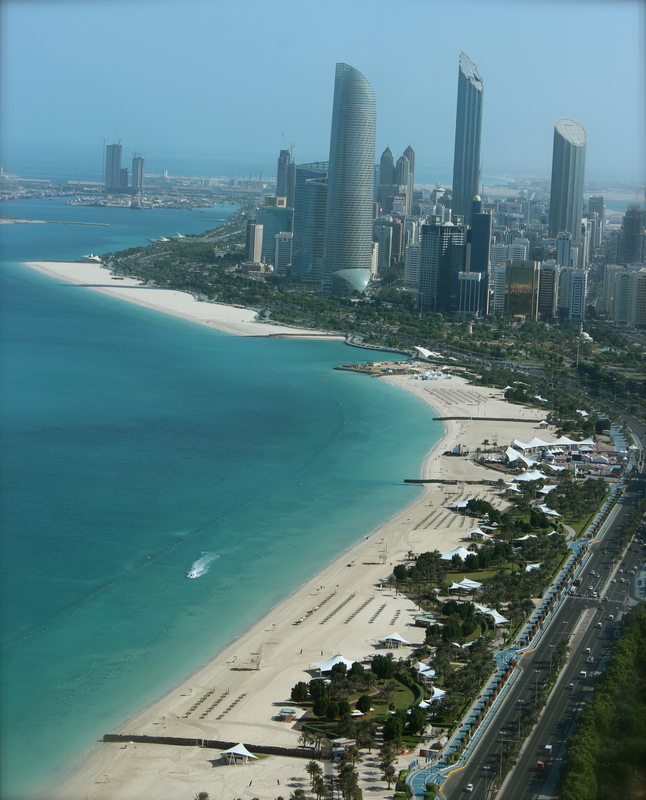 The Corniche in Abu Dhabi is a beach front promenade. It’s great for an early evening walk to watch the spectacular sunset. 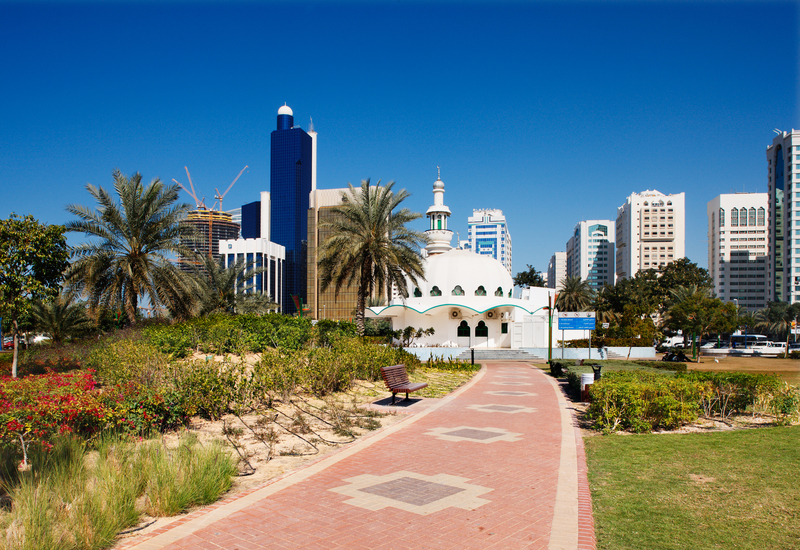 Al Markaziyah Gardens is the Abu Dhabi’s most popular park. The Emiratis really are into their families and there’s a plethora of parks and playgrounds, including Khalifa Park where the Murjan Splash Park is located. The children and I had a fabulous time in Abu Dhabi! I found it safe, clean and family-friendly. 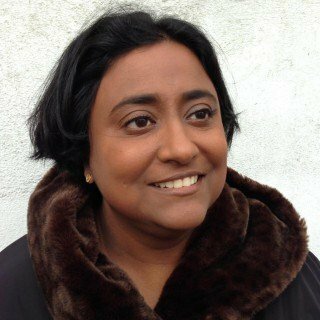 The harsh punishments for disobedience meted out by the rulers really do ensure compliance. I thought of it in many ways as ‘Singapore in the Middle East.’ The flight time is 7 hours from London which makes it closer than lots of other places as a winter sun destination. Luckily, my friend is in Abu Dhabi for 3 years and I’m sure we will have a return visit. Abu Dhabi does not allow Skype or Facetime. You’ll need to find alternate means of keeping in touch with people at home. Only the tourists walk outside during the day. 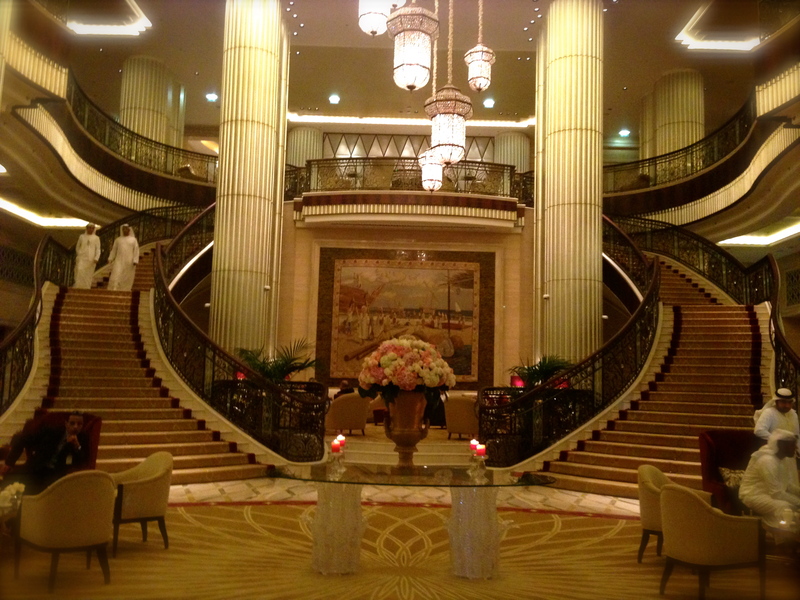 I thought my kids were being wimps for not walking the 10 minutes to the Emirates Palace. After I did it on my own, I was eating humble pie. Even in the shade and without humidity, the heat itself is wearing. Taxis are cheap and plentiful even if many of the taxi drivers are fairly clueless about actual driving or destinations. 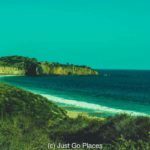 It helps to have good directions to where you want to go (look on a destination’s website). Do NOT get out of the taxi until you know you are at the right place or don’t pay him beforehand if you need to get out and check. You could get stranded on a construction site a long hike from civilisation, as your taxi driver speeds away into a cloud of dust. Everything is open really late. Many places are deserted during the noonday sun (or even closed) because sensible local people stay inside. If you have active children, afternoon naps may not be an option. On the plus side, attractions may be less crowded and easier to visit. What do you think? 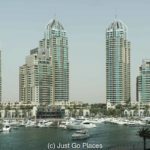 Would you consider Abu Dhabi for an easy winter sun option? I know my children can’t wait to go back. Next year, they will be tall enough for the Ferrari roller coaster and I am already panicking over the thought. What a wonderful travel Shobha!! !I have to go to Abu Dhabi…I think every architect MUST go there! The modern architecture really is stunning. I guess they have the money to hire the most talented architects and use cutting edge materials to push the boundaries of design. Hallo! I found your blog from Selena’s Afternoon Tea list. 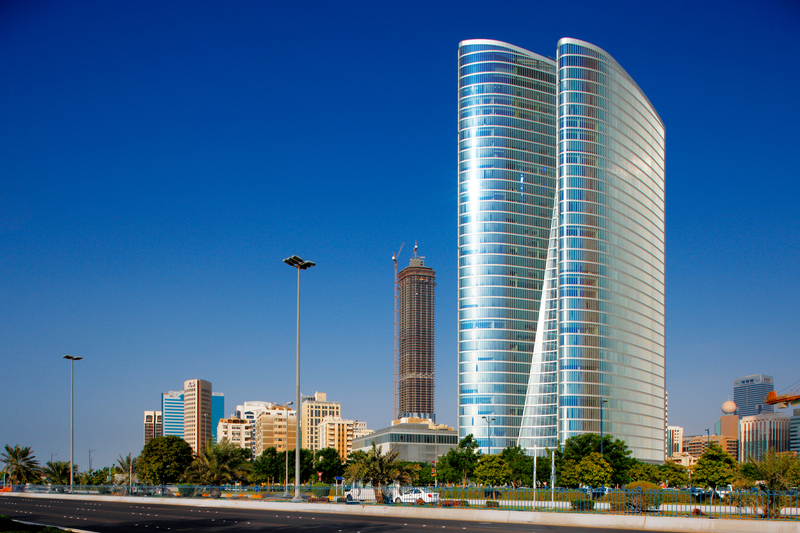 Abu Dhabi looks amazing, from the food to the architecture to the sunshine. I know that my cousin really enjoys it there – perhaps I can convince my husband to go over for the Grand Prix one year! The Grand Prix is during half term next year! very handy …. although it’ll be really busy. I’m sure it will be. We were in Milan for the Italian Grand Prix and it was crazy! Yes, the food was delish. I definitely put on weight even though it was only a week away.